Today was my second half marathon of the year, the Run Like a Girl Half Marathon. This marathon is a non-competitive race, and it is only open to women. 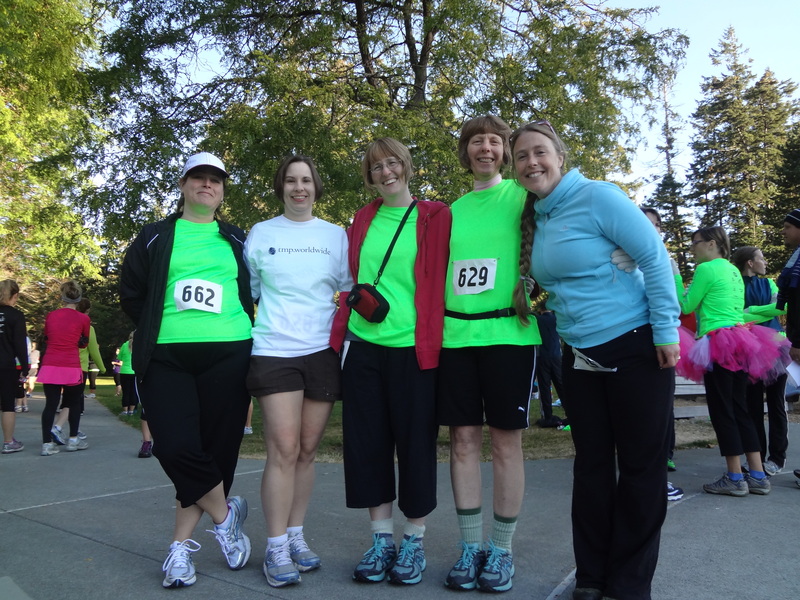 It is my second year doing the race, which benefits the Girls on the Run program. Shelley and I decided not to push ourselves for a personal best this race, and we walked most of it. The volunteers for this race are great, and they have fun aid stations, with chocolate, tiaras, necklaces and a photo on a Harley! We had a great time and ran into several friends before, during and after the race. Check out the awesome swag! We got a Brooks long sleeve logo tech shirt, a logo pint glass, a locally hand-made wire wrapped crystal necklace, a tiara, and a colorful, hippie, peace sign necklace. A morning well-spent for a great cause! 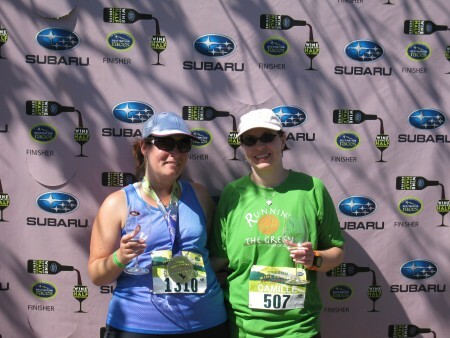 What I Did For Labor Day – Oregon Wine Country Half Marathon! This evening I reflect back on another Labor Day Weekend come and gone. And although Labor Day is supposed to be a weekend of rest, I did anything but. You probably hung out with family, BBQ’d some meat and veggies, ate some pie, maybe went camping or swimming. You did all that because you are smart. I. Am. Not. Nope, I decided it would be a good weekend for my 4th Half Marathon! And I convinced my friend Shelley that this would be a good idea. So, as you unwind from your weekend of relaxation, let me spin a tale of mine. 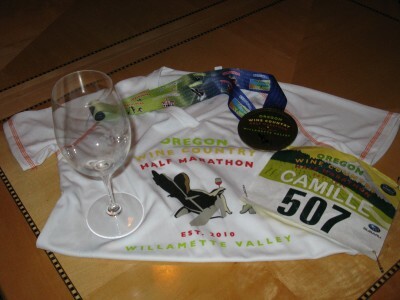 The half marathon we signed up for was the Oregon Wine Country Half-Marathon. It is one of a series of half marathons put on all around the country by Destination Races. This isn’t just your typical half marathon. Nope, they promise beautiful views of vineyards and scenic farmland, an on-course tasting and a post-race wine tasting with 27 different wineries! Plus, for those people who have an athletic bone in their body (I don’t) and might actually stand a chance as finishing in the top 3 of their age division (I have no chance), you can actually win wine! What better motivation is there to hustle! Sunday morning – the alarm clock went off at 4:55 am… I told Shelley to set the alarm at 5, but she thought this would be better… UGH! We got dressed and slammed a bit of caffeine before skipping stumbling out the door into the pre-dawn morning. 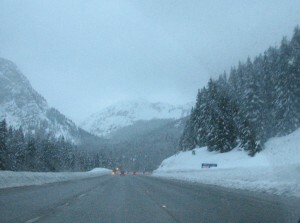 We drove from our hotel in Newberg, Oregon, over to Carlton, Oregon, where the finish line would be. We drove in the dark. We mostly drove without speaking (there might have been some grunts and mumbles). Soon we joined a line of other athletes insane people heading in the same direction, rolled into Carlton and found the parking lot. The place was already crawling. It was 5:41 am. After parking, we got on an old school bus and made the trip in the dark up to Stoller Winery. We were close to the last two on this bus, so I ended up sitting next to a lady in her late 40s from Portland, who had a bit of a race obsession. She told me she was taking next weekend off because the wine country half was her third weekend racing in a row. Ummm… No… I will never have an obsession like that. As we got off the bus, the morning light was just starting to peek over the hills. And it was cold! 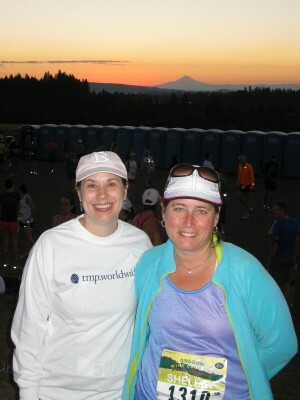 Pre-Race at Stoller Winery – It’s Way Too Early in the Morning for This! We walked up the hill to the winery, and spent the next hour trying to wake up mingling on the patio outside of Stoller – there was a DJ working up the crowd, with some music and some motivation – then the sun began to come up over the mountains in the distance. It was beautiful! Then we saw a tiny little dot – a hot air balloon doing a sunrise flight in the distance, watching the sunrise just like us. 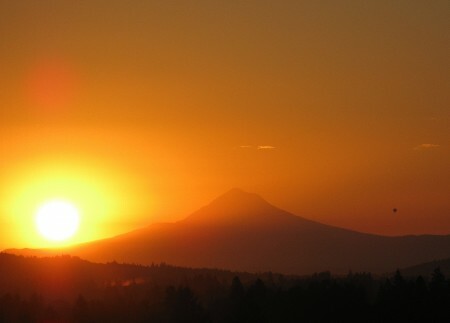 Stoller Sunrise – Can You See the Hot Air Balloon on the Right? Shelley and I had our breakfast of Baker’s Breakfast Cookies – peanut butter and apple cinnamon for me, pre-race hydration and one last stop at the Honey-Bucket before heading back down the driveway to the start line. We lined up and then! We waited… They were a couple of minutes late sending us off, but pretty soon, the gun went off and everybody started to move! Mile 1 – Since we are walkers mostly, we try to start near the back, but as always, there are a million runners who don’t line up until the end and end up behind us. So, the first mile is people passing us. We passed by some cows, and their cow smell, and some horses (horses don’t smell, of course). We jogged and walked and jogged some more. Feeling pretty good at this point! Mile 2 – 3 – We wove through a residential neighborhood in the town of Lafayette, with cute little tract homes sleeping in the early morning light. A few residents came out to watch and cheer us on, and the first aid station supplied us with water. At this point, we were neck and neck with a man we called Doctor’s Order’s, an older (late 50s) man who was pretty overweight and seemed like he might collapse at any point. He was really puffing loudly and had already sweated out a kiddie pool of water… Good for him for giving this a go, but we really hoped he had ok’d it with his doctor. Mile 4 – The second aid station offered water and Honey-buckets. Shelley had to go, and I wanted to beat my standing personal best time, so we said our goodbyes here. I continued on my own down some tree lined roads – the shadiest part of the course. There were some pretty Bed And Breakfasts – I might have to look into staying there one day. At one point there was a little park area with a couple of picnic tables near a marshy pond – it looked like a great place for a picnic – a picnic was sounding really good at that point… The crowd had thinned out considerably, and I passed and was passed by the same several walk-joggers multiple times as we each pushed ourselves. 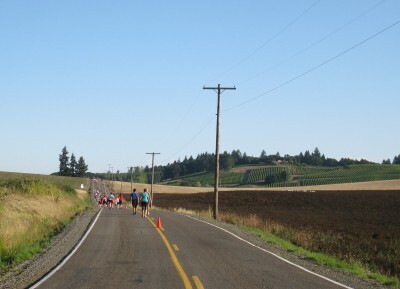 Mile 7 – 8 – This long, straight stretch of country road was the easiest part of the course, with a slight elevation decline. At this point, mostly alone with my thoughts, I pondered why I keep torturing myself with half marathons. Isn’t one enough? Do you really need to do 4? I won’t be like that lady on the bus… Never mind that I have another coming up in just over a month. I was shaken from my ponderings by a lady who was talking loudly on her cell phone!?! What is possibly important enough that you have to answer a call during a half marathon? Judging by the conversation, no one was dying, nothing was on fire, and she didn’t just discover she had a long-lost sister. I always wanted a sister… Mom? At the beginning of mile 8, I passed Lemelson Winery, a winery Jon and I have thought about visiting but just haven’t had a chance to get to yet. They handed out a tiny little plastic cup of Pinot Gris. I didn’t have a chance to savor the nose, but it tasted like salty sweat and cotton-mouth. In all fairness, I’m sure Lemelson makes a wonderful Pinot Gris and I would love to taste it when I’m not busy trying to keep from falling to my knees in the middle of a country road. Right after the Pinot Gris, they gave us more water. I took two. Mile 9-10 – These few miles showed me well that I am a fast walker. When I jogged, I passed some of the slower joggers. When I walked, I kept up with them. I had a nice conversation about GPS watches and my hometown with a man and woman – they were jogging, I was walking. Once I was rested, I broke into a jog again and left them behind. This is the point in the race where I counted the miles left to go as much as the miles already completed (that’s about the extent of my skill with math in my head, by the way). I also was starting to get pretty excited because I was still keeping a really great pace! At mile 10, I began hearing music and thinking it was so nice of them to blast the radio. As I rounded the curve, I realized it was a band! And they were good! They were covering an 80s song, I can’t remember which one, but it sounded like the real thing! It really pepped me up, and it’s a good thing, because it was time for the gravel section. And wow was it hot! If the race organizers ever read this, I really hope you consider having us run through a misting tent (you know the kind they have at fairs that mist cool water over you?) around mile 9. That would be nice. Getting So Close – But Darn that Gravel! 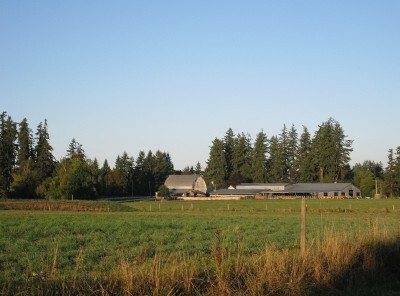 Mile 11 – Gravel road. I probably don’t need to say anything more. Less impact on the legs, but slow, dusty and those rocks can really do a number on the bottom of your feet! There were some nice little farms, but I couldn’t wait to get off the gravel! 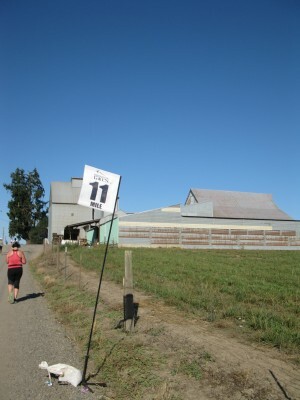 Shelley said a woman walking with her at mile 11 commented on the big hill in the photo above. Shelley laughed to herself – we have way bigger hills at home… The woman at the last aid station was cheered me on with “You are almost done with the gravel!” It worked… Those were the sweetest words I heard during the whole race! Mile 12 – I was so tired. I was still pushing as hard as I could but I certainly wasn’t jogging for long distances anymore… But I was still passing people! I just kept trying to keep my walking pace as fast as I could. And I could hear the finish line, even if I couldn’t see it yet. Soon enough, I rounded the last turn and could see the finish line in the distance. Up a hill… UGH! I had a really tough time doing that last little bit at a run, but I did! I was done! I had finished my 4th half marathon, and with my best time ever! I crossed the finish line with my first sub-3 hour half-marathon time of 2 hours, 56 minutes and 41 seconds! My pace was 13 minutes 29 seconds per mile. I was so proud of myself! Shelley did really well too, finishing shortly after I did with a time of 3 hours, 10 minutes and 14 seconds! Shelley and Me – All Done! Bring on the Wine! My Race Swag – I Love the Size of the Medal! P.S. In case you were wondering, Doctor’s Orders didn’t die, and he did finish the race. Sometime between me and Shelley. And the Little Nubs Carried Me Home! Today I had a quiet day nursing my sore back. Yesterday I completed my third half marathon (a big accomplishment!) in three hours and thirteen minutes! That’s a pace of 14 minutes and 44 seconds per mile. 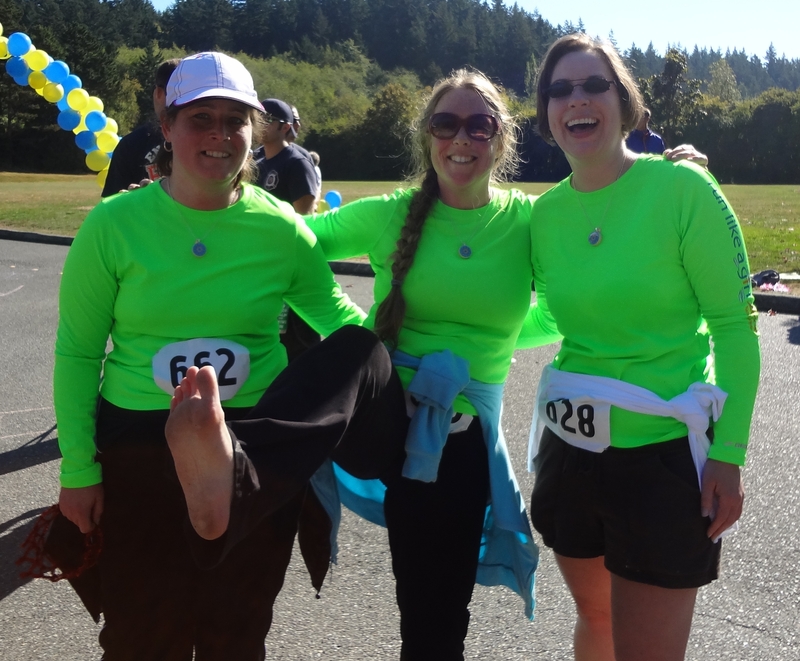 Since I mostly walk my half marathons rather than run them – that’s a very good pace for me! The day started off with my fellow gluttons for punishment half marathoners and I on Team $1 Sushi (more on the team name in a minute) queuing up before the race. Katie, Shelley and I were in it for the entire 13.1 mile distance. Bliss and JoAnne were planning a less insane more manageable goal of half of a half (6.55 miles). The weather was cold, but the day had dawned bright and sunny and would be warming up quickly, so I didn’t want to overdress and overheat later in the race. I opted for shorts and my long sleeve race shirt (a moisture wicking high performance shirt by Brooks). I started out with another long sleeve cotton shirt over that. So Team $1 Sushi, you ask? Well, there’s a story behind that. Shelley had emailed me about signing up for the Run Like a Girl Half Marathon a few days before Katie, Bliss, JoAnne and I (and a few other fabulous women who opted not to do the race) were to meet up for a Sushi Happy Hour that features $1 per piece sushi. I pitched the idea to them – because they are all trying hard like me to stay fit. They loved the idea (at least back then they did) and Team $1 Sushi was born. So, back to race day. 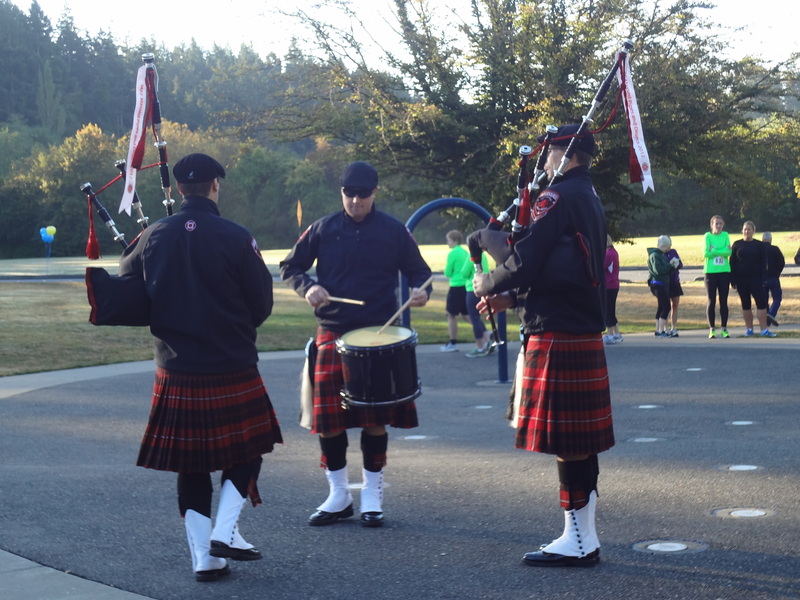 The race kicked off with a serenade by the Firefighters Pipes and Drums band. If we weren’t already awake from the cold air, we were now! They play well, but let’s admit it, bagpipes and snare drums are loud! And not really very soothing. Then we all posed for a group picture (ladies are much more into group pics – this would be tougher in a co-ed race). And then we lined up to begin the torture session race. We set out at 9:10 am. Bliss and JoAnne wanted to do a bit slower pace, so Katie and Shelley and I set out a bit ahead of them. We chitter chattered, and soon ‘the rules’ were formed. We would push ourselves to jog as much as we felt we could – anybody could call for a tiny little jog, and anyone could call for the end of it. So the jogging stints became known as “Tinies.” “Tiny On,” was the call to begin jogging, and “Tiny Off” was the call to stop. And we continued that tradition for the rest of the race. Early on, Katie found her inspiration in the ‘Cool Pants Lady.’ It started out as doing a “Tiny On”, just until we caught up with Cool Pants Lady. Cool Pants Lady was about 60 – so this seemed like a reasonable goal. And we did catch up – but little did we know that Cool Pants Lady was just in her warm up phase – pretty soon she pulled away again and smoked us! After we got smoked by Cool Pants Lady, we caught up to a girl I went to high school with named Renee and her friend – we were pretty neck and neck for awhile, but then we started pulling away! We were their inspiration and setting the pace, and it was hysterical when Katie stopped to tie her shoe and Renee’s friend cried out, “One of them is down – one down!” But nope, Katie was back up and doing a “Tiny” to catch up! This half marathon was a blast, all the aid stations had fun themes – we got lei’d at mile 2, at mile four we got chocolate and a raffle ticket for a “Margarita” prize, the turnaround at mile 6.55 had a photo op with one of the boot camp trainers in town – and he was dressed in drag! 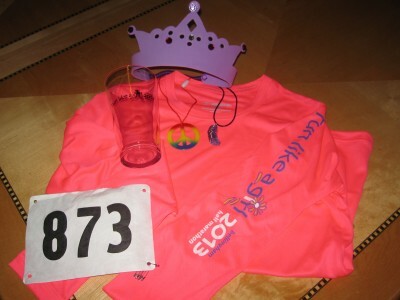 Mile 8 had more chocolate and another raffle ticket for a pedicure prize, and mile 11 had a tiara! We were cheered on with cowbells, and the support of all the ladies we passed and were passed by. And last by not least, the peek-a-boo views of the bay and the islands were fantastic! Nothing like a view to take your mind off the misery. I wanted to do my best to push as hard as I could for time, so towards the end I did some very long “Tinies.” Katie started making whiny gutteral sounds during Mile 11, as her motivation was flagging – I was sure for a short period of time that I would die! I’m not sure where I found the strength, but I ended up jogging most of mile twelve! Not fast, but faster than a walk! I am very proud of myself – and am excited about my 3 hour, 13 minute finish! At the finish line, we got a daisy necklace as a finisher medal, put on by a firefighter. And we all finished – the sweetest success for Team $1 Sushi!